The following is a list of the Internet’s eight biggest Google AdSense publishers. The information was compiled from interviews and articles found on the Internet. Whenever possible, I list the source of the information. I apologize in advance if I missed anyone on the list. If you make more than the people listed, please send me proof of your Google AdSense earnings and I will add you on the next time the list is updated. This is a list of individual site owners – people just like you and me. Big corporate AdSense publishers like AOL are excluded. Markus Frind is a local Vancouverite who is turning the online dating world upside down. His site, Plentyoffish.com is the biggest free dating site on the Internet. Plentyoffish.com receives up to 500 million page views per month and make over $10,000 per day for Markus, who runs the site from home. You think a site this big would be staffed by a hundred people but the only employee that Markus has is his girlfriend, who helps to answer the emails. Markus coded Plenty of Fish all by himself. The site is lean and mean and requires only four servers to handle all that traffic. Doubts about Makus’s Google earnings were silenced when he posted this $900,000 check from Google. According to Markus’s blog entry, the check represented two months of AdSense earnings. Kevin Rose started Digg in December of 2004 with just $1000. Today Digg is one of the biggest news sites on the Net, with over 400,000 members and over 200 million page views per month. According to this article from Business week, Digg will make $3 million this year from a combination of Google AdSense and Federated Media ads. Unfortunately, only Mr. Rose and his accountants knows how much came from Google and how much came from Federated Media. I can try to take a guess based on the number of times I have seen a Federated Media ad vs. a Google ad on Digg but, being in Canada, it’s almost 100% Google ads. Whatever Google’s share of Digg’s $250,000 per month in ad revenues may be, one thing is for sure, it is not small. If ever anyone can be considered an Internet marketing superstar, ShoeMoney would be near the top of the list. Jeremy Schoemaker is a search engine marketer who knows how to take advantage of both Google AdSense and AdWords. In the above photo, you see him with the biggest Google AdSense check he has ever received from Google. The income was earned back in the month of August 2005. Since then Mr. Schoemaker has moved to wire transfers. No doubt, he got tired to dealing with the bank tellers when trying to deposit $100K plus checks every month. Unlike the other Google whores on this list, ShoeMoney, as he likes to be call, does not own just one site. He makes his enormous Google checks using hundreds of sites and thousands of domains. Before Jason Calacanis sold Weblogs, Inc to AOL for $25 million, he got the network of blogs making over $4,000 a day from Google AdSense. So impressive was his AdSense performance that Google used Weblogs for a case study. Now that AOL controls Weblogs, you can bet it is making a lot more than a measly $120,000 a month. According to this Washington Post article, David Miles Jr. and Kato Leonard, claims they make $100,000 a month from their site, Freeweblayouts.net, which gives away designs that people can use on MySpace. The only problem with the revenue figure is it is not 100% AdSense. Free Web Layouts use other advertising networks in addition to Google. However, with a claimed $100,000 per month in revenues, I am fairly confident that the AdSense portion is higher than our next Google whore. Tim Carter is a licensed master plumber and carpenter with his own radio show. He also makes frequent television appearances. He founded AsktheBuilder.com in 1995, The primary focus has been catering to an avid following of fellow builders on the site. According to the Google case study, Mr. Carter did such a good job tweaking the Google ads on his site that it now makes $30,000 a month. Joel Comm is get rich quick guru. He wrote the best selling e-book, What Google Never Told You About Making Money with AdSense. 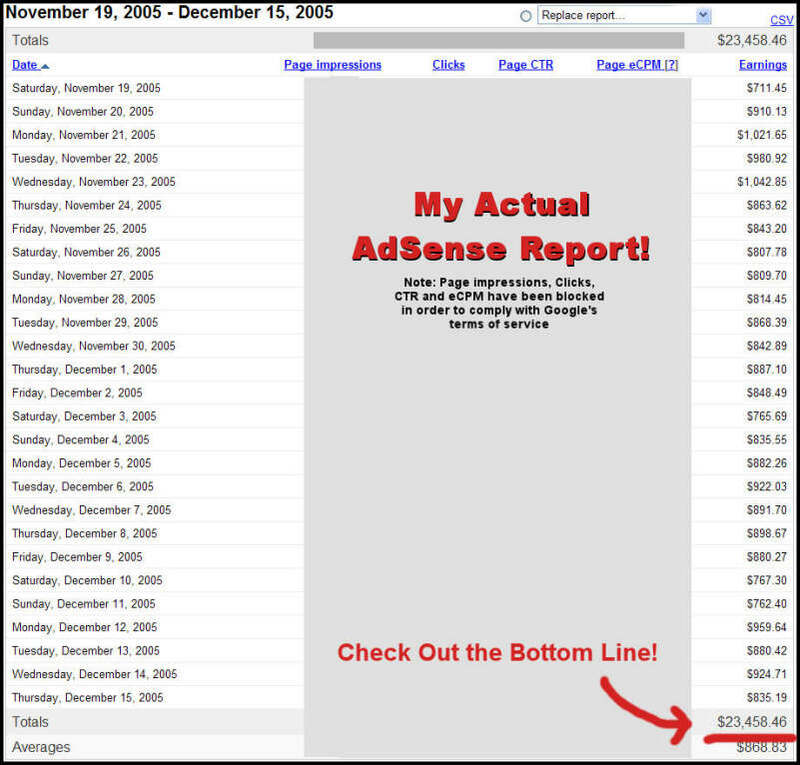 The e-book, along with the website that promotes it has a screen shot of Mr. Comm AdSense earning from November 19, 2005 to December 15, 2005. Whether or not Mr. Comm still makes this much from Google is anybody’s guess. Back in January of 2005 the New York Times had an article about AdSense, featuring Shawn Hogan, founder of DigitalPoint. The article states that Mr. Hogan makes $10,000 per month from Google AdSense using a very unique revenue sharing model. Google pays Digital Point about $10,000 a month, depending on how many people view or click on those ads, said Shawn D. Hogan, the owner and chief technology officer of Digital Point. DigitalPoint have grown a lot since that article and while Mr. Hogun would not say anything, the DigitalPoint forum members speculate that he is making at least twice that amount now.